Father Mark Gottemoeller, a retired priest of the Archdiocese of Indianapolis, died on Dec. 15 at IU Methodist Hospital in Indianapolis from complications after surgery. He was 68. The Mass of Christian Burial was celebrated on Dec. 21 at St. Gabriel the Archangel Church in Indianapolis. Archbishop Charles C. Thompson was the principal celebrant of the Mass. 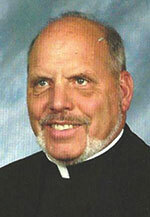 Father Michael O’Mara, pastor of St. Gabriel, was the homilist. Burial followed at the priests’ circle at Calvary Cemetery in Indianapolis. Father Gerald Kirkhoff, archdiocesan vicar for advocacy for priests, knew Father Gottemoeller for more than 40 years. He described him as a priest who sought to help people on the peripheries of society and of the Church. “Mark was always for the underdog,” Father Kirkhoff said. “Mark was a person who went to the prisons. He dealt with people who were struggling with thoughts of suicide, people who had problems with the faith. “He was down to earth. He had what Pope Francis says we [priests] should have: the smell of the flock. Get out of the rectory, get out of the office, and go out there. That was his hallmark. “He was looking for the person who was suffering, and he tried to do his best [to minister to him],” he added. Father Kirkhoff also recalled his friend’s love of the outdoors. Mark Gottemoeller was born on June 10, 1949, in Indianapolis to Walter and Josephine Gottemoeller. He grew up as a member of St. Mark the Evangelist Parish and later of St. Jude Parish, both in Indianapolis. Father Gottemoeller received priestly formation as an archdiocesan seminarian at the former Latin School of Indianapolis, the former Saint Meinrad College in St. Meinrad, and at Saint Meinrad Seminary and School of Theology, earning a bachelor’s degree and a master’s of divinity degree. He was ordained a priest on May 22, 1976, by Archbishop George J. Biskup at SS. Peter and Paul Cathedral in Indianapolis. His first pastoral assignment was as associate pastor of St. Gabriel Parish in Connersville, serving there from 1976-80. Father Gottemoeller then served as associate pastor of St. Joseph Parish in Shelbyville from 1980-81; as associate pastor of the former Holy Family Parish in Richmond in 1981; and as associate pastor of St. Mary Parish in Greensburg from 1981-85. Beginning in 1985, Father Gottemoeller began eight years of ministry in the Tell City Deanery. He served from 1985‑93 as pastor of St. Augustine Parish in Leopold and administrator of St. Mark Parish in Perry County. Beginning in 1989, he additionally served as administrator of Holy Cross Parish in St. Croix while continuing his leadership of St. Augustine and St. Mark. Father Gottemoeller served as pastor of St. Martin of Tours Parish in Martinsville from 1993-2005, and as pastor of St. Thomas More Parish in Mooresville from 2005 until he was granted early retirement in 2016. He is survived by a sister, Christine Dittman of Dayton, Ohio.